I fully understand that Gymnastics Unlimited ,CampKidsNJ and/or Ninja Zone staff members are not physicians or medical practitioners of any kind. With the above in mind, I hereby release the Gymnastics Unlimited ,CampKidsNJ and/or Ninja Zone Staff to give first aid to myself, child or children in the event of any injury or illness, and if deemed necessary by staff to call a doctor or ambulance to seek medical help, including transportation by its representatives, whether paid or volunteer, to any health care facility or hospital. I also authorize the physician and/or hospital to perform treatment for any injury or illness to child, children or myself. I authorize payment for treatment, either personally or through our family health insurance. I have been made aware the risks and hazards associated with the sport of gymnastics, trampolines, tumbling, cheerleading, dance, ropes course elements, and all other activities. Students may suffer injuries, possibly minor, serious, or catastrophic in nature, and/or including death. Parents will make their children aware of the possibility of injury and encourage their children to follow all safety rules and coach's instruction. The Gymnastics Unlimited ,CampKidsNJ and/or Ninja Zone Staff will not accept responsibility of injuries sustained by any student through the course of instruction in gymnastics, trampolines, tumbling, cheerleading, dance ropes course elements, competitions, special events, camps/clinics, transportation and all other activities. With the above in mind, and being fully aware of the risks and possibilities of injury involved, I consent to have myself or child participates in the programs provided by Gymnastics Unlimited ,CampKidsNJ and/or Ninja Zone I, my executors, or other representatives, waive and release all rights to claims for damages that I or my child may have against Gymnastics Unlimited ,CampKidsNJ and/or Ninja Zone and/or its representatives whether paid or volunteer. I also affirm that I now have and will continue to provide proper hospitalization, health and accident insurance coverage, which I consider adequate for both my child's protection and my own protection. I also understand it is the parent's responsibility to warn the child about the dangers of injury. Gymnastics Unlimited ,CampKidsNJ and/or Ninja Zone will only warn students through "safety rules" and our teaching style and progressions. 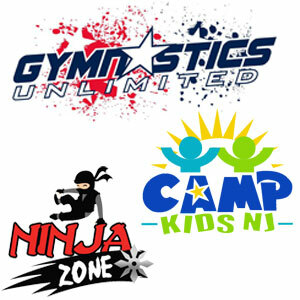 Gymnastics Unlimited ,CampKidsNJ and/or Ninja Zone reserves the right to cancel classes at any time for any reason. I release myself or my child's photo or video to be used in any positive manner in association with Gymnastics Unlimited ,CampKidsNJ and/or Ninja Zone. I.e. newspaper press releases, advertising, web page, etc. Permission is also granted to the studio to copyright such photographs in its name. Payment is due day of registration. There is a $20.00 fee for returned check charge or declined credit card plus any bank fees. Registration and insurance is $35 per child per year with a $55 family maximum. As the legal parent or guardian, I release and hold harmless Gymnastics Unlimited ,CampKidsNJ and/or Ninja Zone its owners and operators from any and all liability, claims, demands, and causes of action whatsoever, arising out of or related to any loss, damage, or injury, including death, that may be sustained by the participant and/or the undersigned, while in or upon the premises or any premises under the control and supervision of Gymnastics Unlimited ,CampKidsNJ and/or Ninja Zone, its owners and operators or in route to or from any of said premises.